The long Easter bank holiday weekend is just around the corner; a welcome chance for a break to spend quality time with friends and relatives, celebrate religious traditions and, of course, eat a lot of chocolate. If you gave up chocolate for Lent, the latter is likely to be your most pressing concern over Easter, and after a 40-day and 40-night break from the sweet treat, you’d be forgiven for gobbling it up and stuffing it into your face. But that means messy mouths and sticky fingers; something that’s pretty much unavoidable with little ones at Easter time anyway, let alone chocolate-deprived big kids too. With greedy mouths and chocolatey hands, stains on clothes, soft furnishings and even walls are a huge risk when there’s so much quickly melting chocolate around. Chocolate stains on white or pale fabrics don’t have to mean a ruined garment; it just needs careful treatment. Firstly, remember to never use hot water when trying to remove melted chocolate from clothing, as the heat can encourage it to soak in further. It’s also important to start treating the stain as soon as possible to prevent permanent damage. Begin by scraping away any excess chocolate carefully using a knife, taking care not to snag the fabric at the same time. Then, you need to create a paste from baking soda and a little cold water to soak up the stain. If it’s still visible after this, apply a small amount of laundry detergent to the stained patch directly, then immerse the garment in cold water. Leave it to soak for a few minutes, revisiting the item to scrub the affected area regularly until the stain has vanished. All you need to do then is wash the garment as normal and it should soon be looking as good as new. 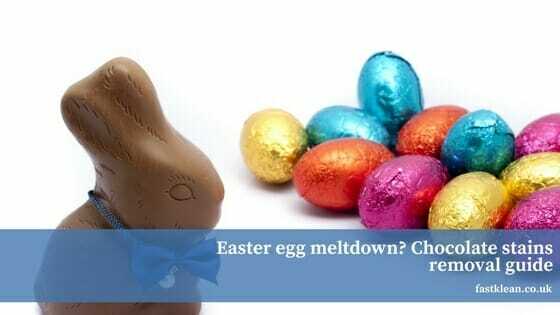 You need to follow a similar method to the one outlined above in order to remove melted chocolate from soft furnishings like sofa covers and cushion cases. Tougher fabrics such as those covering seats may require a longer soaking time, but it’s important to be patient to make sure your chocolate stain disappears completely. If you’re really struggling to remove chocolate from your furniture coverings, FastKlean has a specialist upholstery cleaning service that’s here to help. Our professional experienced team of expert cleaners use both wet and dry cleaning methods depending on the type of fabric that needs attention to produce the best result possible. With so much chocolate floating around over the Easter period, it might be a couple of days before a stain comes to your attention. Dried-on chocolate is harder to remove than chocolate that’s just been dropped, but you should still follow the same steps outlined above for washing stains out of clothing and soft furnishings. If the stain is particularly tough, using a natural mild bleaching agent like lemon juice could help to remove it, but you will risk permanently changing the colour of the fabric you’re treating due to the acid in the product. However, if you have a throw or cushion that you can strategically place over the affected area afterwards, this doesn’t need to be an issue. How do bloggers make their homes look so perfect?